2. Butter and flour the cake tins. 3. To make the sponge beat together the butter, sugar and lemon zest. The mixture has to be really light and fluffy. Add the eggs one at a time with a spoonful of flour, mixing well after each addition. The flour will prevent the mixture from curdling. Add the remaining flour, baking powder and desiccated coconut and mix briefly until everything is just combined. 4. Divide the mixture between the two tins. With the back of a metal spoon dipped in water smooth over the tops so you have an even surface. Place in the oven and bake for 20-25 minutes. 5. To check the sponges are cooked press in the centers if they are springy and just firm they are ready. If they are still squidgy return them to the oven for 3 minutes and check again. 6. Once cooked leave in tins for 5 minutes then turn out onto a wire rack and allow to cool. 7. 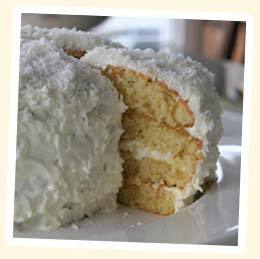 Beat together the cream cheese, coconut cream, lemon zest and icing sugar until creamy. 8. Cut each of the sponges in half horizontally to make four layers. Spread half the lemon curd on one layer, and then sit another layer on top. Spread a good dollop of the cream mixture over this one, placing the third layer on top. Spread the remaining lemon curd over this and add the final layer. The rest of the cream can now be roughly spread over the top and sides of the cake to give a fluffy ‘cloud’ effect. 9. Place a sheet of grease proof paper underneath the wire rack to catch any excess desiccated coconut and generously scatter the coconut over the top and sides of the cake (using what you catch on the paper to finish the job). 10. Serve with a pot of Inspiration Tea and enjoy.